From the preview of episode 5, I figured that this episode would be made into a horror flick. Or so I thought. Much of the buzz are nothing but false perception because the episode is nothing close of being horrific, not even to the extend of scaring off the cats away. Lame indeed. It was even obvious from the first few minutes that there is no way that it’s going to be scary to watch. Though some of the scenes maybe suggestive but those are more the dark past rather than being so ghoulish. Speaking of which, I was surprised to know that Sana may not be the only one with a dark secret. Nanaka, of all the people, have an unfortunate past related to violin and it was yet not known. I believe as the story progresses, Sana would learn about this and eventually help her, together with the rest to overcome her fears. Otherwise we won’t be seeing her playing the violin in the OP. Now I wonder what’s fire had to do with any of those dark past? Another music review and this time, I’m taking on Japanese music. I am a fan to the Japanese pop culture but not to the extreme side. Even so, I find very few Japanese music to my liking but somehow I am much attached to J-Rock. I suppose that their rock genre is well suited for me. And here are two Japanese rock bands that received fairly widespread popularity. L’Arc~en~Ciel must be the best and the most popular Japanese rock band after B’z. I look B’z as Japan’s own Rolling Stone but nothing can be synonymous to L’Arc~en~Ciel. Bold if I may be but I believe L’Arc~en~Ciel has reinvented rock, if not J-Rock. Not only they received huge popularity in their homeland, they have also have a huge fan base in many other countries. And includes myself. Sure enough, their latest KISS is their most anticipated release this year after teasing fans with various singles releases.Despite the title, KISS have a rather festive mood to it with tracks like Hurry Xmas, Seventh Heaven and Link. And yeah, just like any other Japanese album out there, most of their tracks are already on release as singles. So I’ll be getting to the new ones. In general, each of these new tracks are distinctive but some have adaptive flair from their older album such as REAL and SMILE. However among them, my favourite is Spiral, which is another original tune from them. As I have mentioned earlier, KISS may have that festive mood kicking but it is not a holiday special release although you might consider that particular Christmas song. 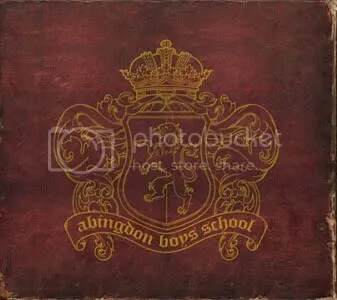 abingdon boys school may be a new rock band but their lead singer is a veteran in the industry who is formerly known as T.M. Revolution. abingdon boys school have tried hard to make the big break by making songs for various animes. From stay away for NANA and INNOCENT SORROW for D.Gray-man to the much popular anime Darker than BLACK with HOWLING. Indeed they did a good job for a decent publicity exposure. The underlying issue is whether they will be perceived well by millions of listeners in Japan and across the globe or not. One cannot simply rely on the huge fanfare generated from anime alone. In regards to their self-titled debut album, they did well in producing original tracks. However each of them are not so different to each other. At times, it is hard to differentiate which track to which. Suffice to say, they all sounded the same but it is not too boring to listen to. Although most of the tracks are average to me, there is one particular track gained my attention. abingdon boys school attempted to make their own rendition of Dress, made popular by BUCK-TICK. And honestly, abingdon did better for this song this time. So that’s one point advantage for them. In the spirit of giving this holiday (I know it is still early but it felt like Christmas comes early this year, don’t you think? 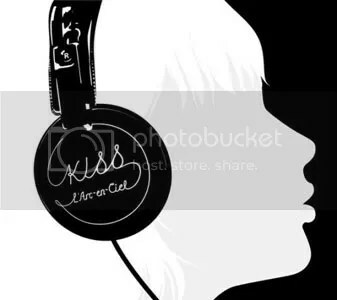 ), two of these awesome albums are available for download – KISS and abingdon boys school. Files are hosted on sendspace so the download link may be available for limited period only. So grab ’em while they’re hot. What I like about Kimikiss pure rouge is the use of water colour in the colour range. This is definitely those similar with Honey and Clover. And what do you know, something we are familiar with here. Nodame Cantabile may have use this water colour effect but it is not too distinctive as compared to Honey and Clover. However in Kimikiss, it was pretty obvious. Or rather, it stands out. Sadly enough, the OP and ED songs are not so great or at least not of my liking. What I really like about Honey and Clover other than its story and the comical characters, are the insert songs. I have to say, I’m a fan of Suga Shikao and the songs used are just well placed. In fact the insert songs are all over the place, it seems that nearly all episodes must have one insert song. You can’t expect Nodame Cantabile to have the same since it was all classical music from episode one to the final episode. Even so, music have been the key element in the works by Kasai Kenichi and his crew. So I’d figure if the same is done for Kimikiss or perhaps they’ll trying something new this time? Well I really hope that the humour would live up to expectation because so far, it did not pick up some punches to the funny bones. This is where Myself; Yourself is better performed aside from the well-schemed plot, although Kimikiss would fare much better in voice talent and colour palettes. I’ve got to admit it, Aoi do sound rather quirky. From the people who brought us the lovable Honey and Clover and Nodame Cantabile, comes another anime title which is rather incomprehensible for me. Kimikiss pure rouge would basically means nothing to my ears, not to mention that the term pure rouge is used. I have no idea what the scheming plot the producers have in mind but I did googled for pure rouge. 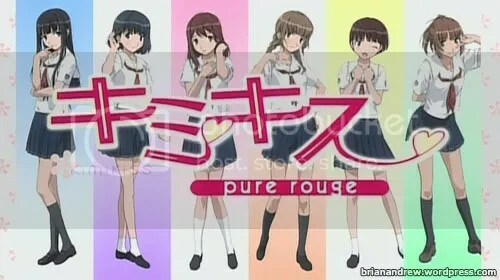 Not surprising that I found countless hits on the actual anime itself, signifying that “pure rouge” is just meaningless but I am not totally wrong when I set my eyes on these – Pure Rouge Mineral Blush. OMG! It’s a cosmetic scam. I’d better leave the conspiracy side for now and back to the actual review. It is yet another teenage romance anime, which is the genre that appeals more to me for this anime season. Have I gone hapless romantic this holiday? Not quite there yet but it’s the best bet for good anime viewing. I am totally aware that it is the same people responsible for Honey and Clover and Nodame Cantabile (I’ve checked it out to be certain). 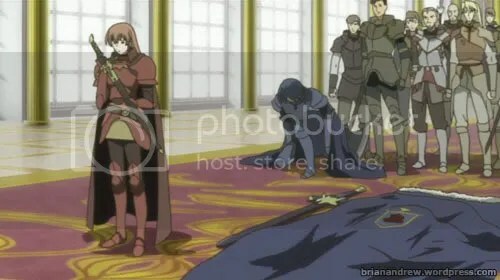 Not surprising is the same animation studio, J.C. Staff was up for the job. Now the question is will it be as good as the predecessors? 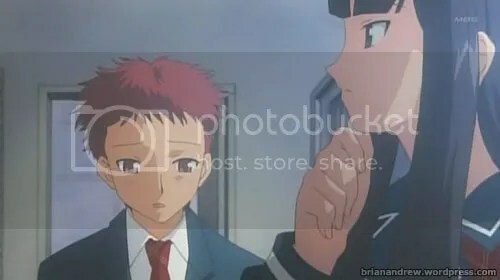 Not to sound like a skeptic but most of J.C. Staff works are brilliant and fairly enjoyable to watch. What I want from Kimikiss however is something up the notch, something unique. 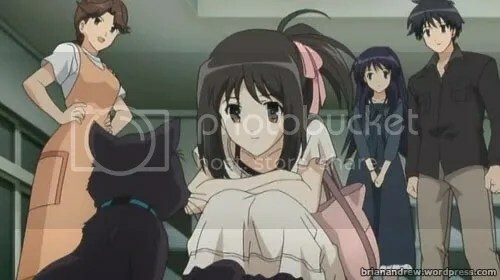 Another member of the cast is introduced in this episode. Surprisingly not of somebody from their school. More ironically is that this girl is a lot younger than them. I suppose having a chibi among the cast is popular (or rather a must) in most anime these days. 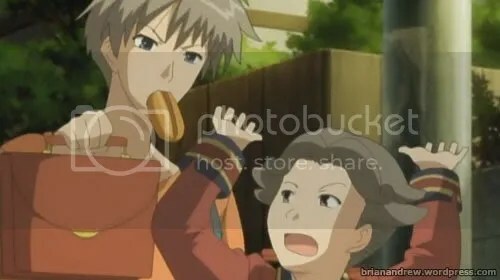 And some cases involve some love interest between the child characters with older ones. Somehow it seems like paedophilia. Bah! I’m just being too conservative and old-fashioned. Why not spice up the story a bit with such forbidden harem? So far, the character development is taking shape. Also I must compliment the animators for their flawless works up to this fourth episode. I just hope such good drawing and animation quality is maintained because it’s shame to tarnish such a good story. I admit it, I gotten hooked to their story. Even so I am still going through more anime titles for this fall anime listings. I’m not quite done yet and still is checking those good animes amongst them. Shuusuke helps a young damsel in distress. Christmas comes early this year with the release of yet another new single from L’Arc~en~Ciel. With the title of “Hurry Xmas”, the intent appears to be true for having an early Christmas. True enough that this song has a very festive tone to it but honestly the song sounded more like those classic Disney holiday songs. At least it lives up to the Christmas spirit. I have to admit it, the song is not too bad after all. Also not to be ignored is the PV. I don’t know if you might notice it but I noticed some of the Santas (yes, there’s an army of Santa at L’Arc~en~Ciel’s Christmas gig) looked kind of gay with their seemingly flirtatious stare. Santa is gay? Parents need to look out for their children whenever they put the kids on Santa’s lap. Seriously. Another rare sight is HYDE smiling for a PV. I’m not saying that he never smiled for his entire life (did he?) but he hardly smiled for the camera in making of a PV. Finally we get to catch a rare glimpse of HYDE’s smile. Errr… should it even be significant? And here goes the PV. If you like this song, fret not because you can get it here. If there are any other L’Arc~en~Ciel’s songs that you wanted to have, simply submit a request politely. And no spamming!